Trees are great assets to any property and help you save on your heating and cooling bills. They are visually appealing. They shade your home in the summer months keeping interior temperatures down. In Warr Acres, we are the areas best arborists. We will happily provide you will all your tree care services that you might need. Do you have a tree on your property that is a threat to your structure? We can come and assess the tree and determine the best way to remove it. We will also remove the stump as well. We will gladly cut the remains of the trunk for firewood. Or perhaps you would like for the tree to turn into woodchip and mulch. Woodchipping and mulching are also a service we can provide for you as well. We can also provide you will the best way to distribute the mulch around your yard. Maybe you have a tree with some brown leaves amongst the greenery. There are many contributing factors for this. But our knowledgeable arborists in Warr Acres are always happy to come to your property and assets your conifer or deciduous trees. One contributing factor to tree limbs having browning leave is not having proper nutrients in the soil. Most of the time when the leaves fall in autumn we are so quick to remove them to keep the yard looking clean. But decaying debris on the ground provides these nutrients back to the tree. We would be happy to provide you with the best tree pruning services in all of Warr Acres. We have expert eyes and particular thought process that goes towards pruning your tree to help the tree optimize its potential. We want you to enjoy your trees shade for years to come. Our specialists thoroughly inspect every tree before they begin pruning. 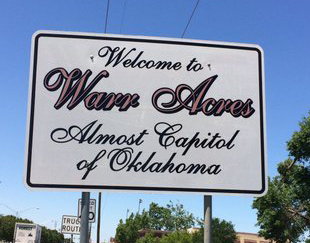 We all know that Oklahoma is prone to some pretty violent weather, Warr Acres is no exception. Sometimes our trees fall victim to these storms. If a tree fell over on your property, we can come out and take care of it for you. There is no need for to try to do it on your own. Call us today, and we'll take care of it for you. Maybe you have a tree that just doesn't seem to be growing right, or seems overwhelmed. We can do what's called a crown reduction. Our arborists will trim back your tree so that the grown inside has a chance to flourish. This process will also know to stimulate new growth. If you have a tree that has fallen on your property, our 24-hour service is well equipt to handle and hazardous situation a fallen tree might cause. Our professionals are always prepared to tackle any issues a fallen tree has caused.